The Ligurian region is the birthplace of the Pesto sauce. More precisely, it was in Genoa, on the north Ligurian coast, that Pesto originated. Basil, a main ingredient of pesto sauce, grows well in the Ligurian temperate climate. 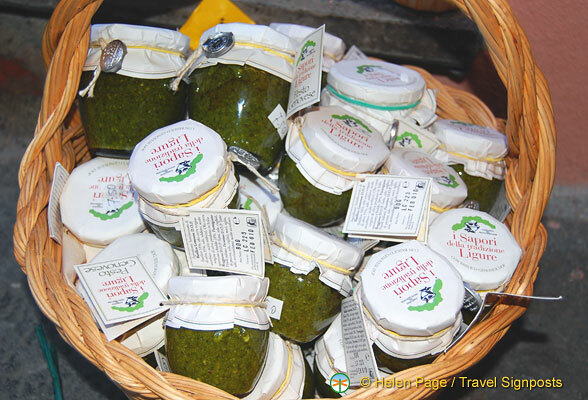 Travelling around Liguria, you’ll see that this sauce is used extensively in dishes. Traditionally, families would use a mortar and a pestle (hence the name) to make pesto. The grinding action of the pestle brings out the flavours of the various ingredients as well as allowing for a smoother pesto texture. If you’ve got a mortar and pestle at home, you may like to try making the pesto in the traditional way at least once so you can discern the difference in flavours. I personally don’t like spending a lot of time in the kitchen and using a blender is much easier even though there is a difference in quality. Note that ground basil oxidizes quickly turning into a dirty green color so use it immediately or store your pesto with a protective layer of olive oil. Pesto is commonly used in pesto pasta dishes like Trofie al Pesto or Fettuccine di Pesto alla Genovese. It is quite a versatile sauce that can be served with potatoes and French beans as well. I like spooning it over a plate of sliced smoked mozzarella, avocado, tomatoes and basil leaves. Served with bread, this makes for a quick and delicious snack when friends drop in.